LANSING — On Oct. 12, 2016, the Michigan Chamber of Commerce and the Michigan Retailers Association filed a brief with the state’s highest court. The brief argued the court should hear an appeal in a property tax case that’s been called “extremely important” to Michigan businesses. 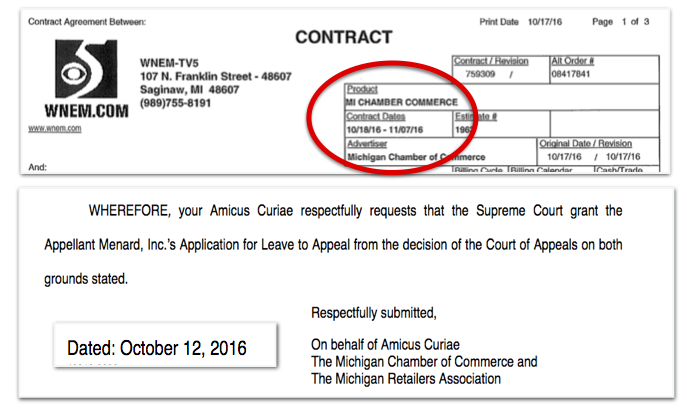 The filing in the Menard Inc. v. City of Escanaba case came just six days before the Michigan Chamber of Commerce launched another effort involving the Michigan Supreme Court: an estimated $1.5-million TV ad campaign to promote two of the court’s seven judges. The judges, David Viviano and Joan Larsen, were GOP-nominated incumbents seeking to hold their seats on Election Day, Nov. 8, 2016. The situation is an example of how groups who fund high-dollar Michigan Supreme Court races and those with interests in cases before the court can overlap. It’s an overlap that can be hard to identify and that’s particularly problematic in Michigan where half of the money in Supreme Court races routinely comes from undisclosed sources. Last year’s election was no exception despite the fact the Supreme Court races were two of the most lopsided Michigan has seen in years. One of the races was decided by more than 40 percentage points. Still, an estimated $1.7 million in dark money poured in supporting the two winning candidates. The high rate of undisclosed money makes it impossible to determine how close the connections are between donors whose checks fund Supreme Court-focused TV ads and the parties directly involved in cases before the court. The Menard Inc. case could acutely impact how property tax bills are determined for big box retail stores across the state. Did a retailer help fund ads run by a group in the 2016 race? Because of Michigan’s campaign finance laws, it’s impossible to say. The Michigan Chamber didn’t respond to multiple requests for comment on this report. With two seats on the ballot and two incumbent GOP-nominated judges running for them, Democrats made little effort to win Supreme Court seats in 2016. Democrat-nominated judges currently hold two of the court’s seven seats. Viviano, Larsen and groups that supported them invested about $3.34 million in the 2016 races, according to campaign finance disclosures and broadcast TV ad estimates by Kantar Media/CMAG (to see a spending breakdown click here). The two Democratic candidates, Deborah Thomas and Frank Szymanski, had about $96,371 on their side. That’s a 34-to-one money advantage for the Republican-nominated candidates Michigan hasn’t seen a spending disparity that large in Supreme Court races so far this century. The widest spending margin over the previous 16 years had been 23-to-one in 2002. Viviano and Larsen also won by large margins. Viviano beat Szymanski, a Wayne County Circuit judge, by 44 percentage points. Larsen beat Thomas, also Wayne County Circuit judge, by 28 percentage points. In an interview, Szymanski said the money difference was an “overwhelming factor” in the race. While the GOP nominees benefited from their status as incumbents and statewide broadcast TV ads, the Szymanski and Thomas campaigns relied heavily on personal appearances at events and YouTube videos, including one with a jingle featuring their names. The overall cost of the 2016 Michigan Supreme Court races was $3.4 million. Only 50.1 percent of that money came from sources that were disclosed in campaign finance reports. The 2016 races were much cheaper than the previous three Supreme Court elections. According to the Michigan Campaign Finance Network’s tracking, in 2014, $10.4 million was spent on races for three Supreme Court seats. That year, donors behind 55.1 percent of the money were disclosed. In 2012, $18.4 million was spent on races for three seats. Donors behind only 24.9 percent of the money in that race were disclosed. In the previous three cycles, 2014, 2012 and 2010, Michigan was home to the most expensive and least transparent Supreme Court races in the nation, according to the Brennan Center for Justice. Michigan has gained a reputation for its high-dollar court races. This year, a judge who was planning on running for the Supreme Court as a Democratic nominee pulled out citing the cost of a potential campaign. Plawecki, who hasn’t responded to multiple requests for comment, said combatting dark money — that’s money that comes from undisclosed sources — was going to be a “major issue” in his campaign. “Suffice it to say that this Catch-22 lives on in our present and unfortunately foreseeable future, political system,” he wrote on Facebook. Szymanski who was asked to consider running after Plawecki dropped out, said he thought he would have at least $100,000 on his side. In the end, his campaign raised only $28,458. 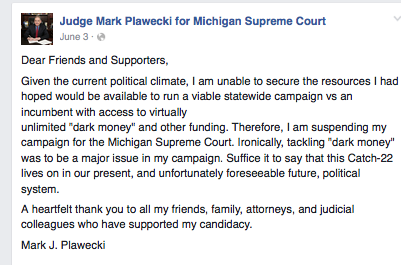 In 2016, the Michigan Chamber of Commerce and the Michigan Republican Party wielded the most undisclosed money in the Supreme Court campaign, easily trumping what Szymanski was able to raise. 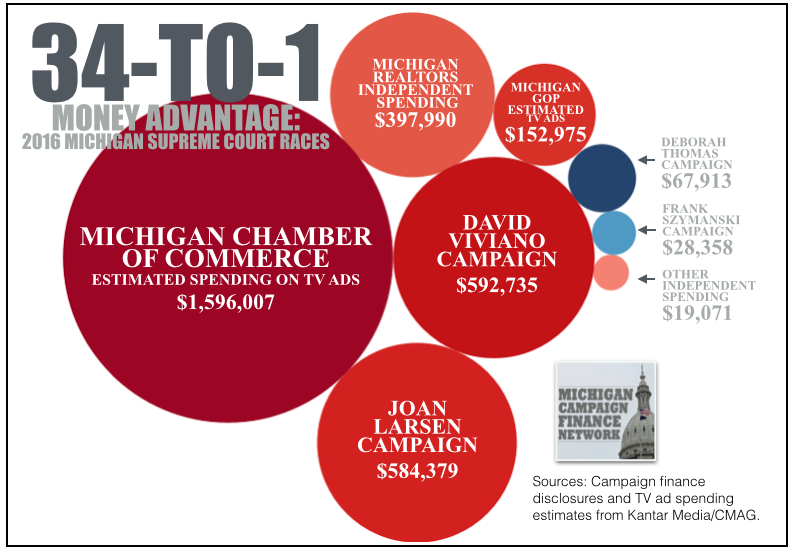 According to estimates from Kantar Media/CMAG, the Michigan Chamber spent about $1.59 million on TV ads supporting Viviano and Larsen while the Michigan Republican Party spent about $121,676. Because of Michigan's lax transparency laws, the donors behind the ads were able to avoid disclosure because the ads didn’t explicitly tell viewers to vote for Viviano and Larsen. Instead, the ads touted the two candidates’ credentials and past rulings. “Larsen and Viviano keep violent criminals behind bars and off our streets,” one ad from the Michigan Chamber of Commerce said before asking viewers to call the judges and thank them. Despite the lopsided 2016 results, some groups still invested heavily to support Viviano and Larsen. The two largest spenders in the races were the Michigan Chamber and the Michigan Realtors Super PAC. Both groups have previously shelled out large sums in Supreme Court races, but they also both happen to have interests in the pending Menard Inc. v. City of Escanaba case. They’re on opposite sides of the case, which focuses on how the properties of big box retailers should be valued for tax purposes. Business groups, like the Chamber, have argued that local government appraisers aren’t properly determining the true-cash value of the properties, which are often constructed for a particular retailer, potentially making them less valuable on the open market. The properties can also be subject to deed restrictions that retailers establish to specifically limit competitors’ ability to use the properties in the future. Groups that represent local governments have alleged that the businesses have been using a so-called “dark stores” strategy to bring down their property taxes by relying on the sale prices of abandoned retail properties to argue down the value of functioning retail properties. The Michigan Tax Tribunal, which hears tax appeals, decided businesses had made their case for lower tax bills. However, the Michigan Court of Appeals decided local governments' assessments were warranted. The businesses are now asking the Michigan Supreme Court to consider the case. The Michigan Chamber has been outspoken in the “dark stores” debate. It’s opposed legislative efforts to take action because of local governments’ complaints. 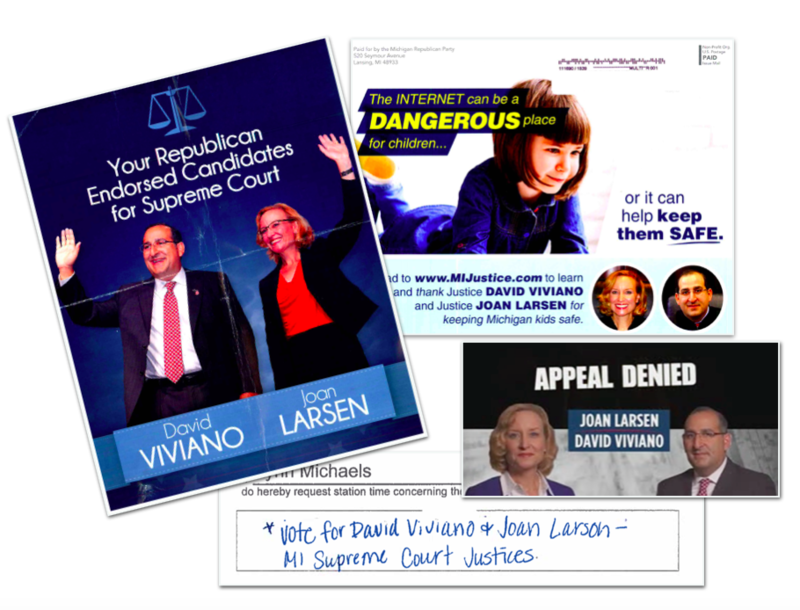 The Chamber spent an estimated $1.59 million running TV ads touting Viviano and Larsen, and its PAC contributed $25,000 directly to each candidate’s campaign. The Realtors Super PAC disclosed spending $397,990 on ads supporting Viviano and Larsen in 2016., according to campaign finance reports. The Realtors PAC reported giving $10,000 directly to Viviano’s campaign and $5,000 to Larsen’s campaign. Combined, the groups accounted for about 60 percent of the money in the Supreme Court race in 2016, according to MCFN's tracking. Neither group returned multiple requests for comment for this story. Michigan is one of a handful of states that have specific rules for disqualification of a judge based on a judge receiving significant campaign contributions directly from a party in a case before the judge. In the Menard Inc. v. City of Escanaba case, the Michigan Chamber and the Michigan Realtors are not the parties involved in the case. The groups have an interest in the case and simply submitted arguments for the court to consider. Asked about groups filing briefs in cases while also spending in races involving the judges, Szymanski said it was “concerning,” but declined to say anything further. Because of the lack of disclosure, it can be impossible to determine if someone closely connected to a case funded advertisements or not.